Whether you are shipping your car to or from Oregon, Best Price Auto Shipping is your online source for getting the BEST PRICE on shipping your vehicle. Fill out the short, simple, no obligation quote form to the right, then start receiving and comparing your auto transport quotes. Do you need to ship a car to or from the State of Oregon? Oregon is one of the most beautiful states to live or visit in the United States. Maybe your are relocating to Oregon or just need to have your vehicle transported to or from here, either way at Best Price Auto Shipping we will guide you through the entire Oregon auto shipping process. Whether you need to ship one car or multiple vehicles we got your covered, just simply fill out the short, simple quote form above, or call 800-691-2347 to start receiving Oregon auto transport quotes. You might be interested to learn a few fun facts about the great state of Oregon, for example did you know after exploration by the French and Spanish during the 17th and 18th century, Oregon was charted by Clark and Lewis during their search for the Northwest Passage. Oregon is bounded in the north by Washington, Idaho to the east and to the south by Nevada and California. The official nickname of Oregon is “The Beaver State”, which is due to the abundance of beavers in that region. The early settlers in Oregon used to trap these animals for their fur and meat. Furthermore, since fur hats were very popular at that time, this fact led to the overhunting of beavers in Oregon and they were about to get extinct in the region. The government then took measures to protect the beavers and their hunting was officially banned in the state. Oregon is the 33rd state to join the union and achieved statehood on 14th February, 1859. Oregon is one of the biggest states in the U.S. in terms of area and ranks 9th among all other states. The Beaver State spans over an area of 98,378 square miles (approximately 254,799 km2). In terms of population, Oregon stands 27th in the United States of America according to the estimates of July 2014 with a population of around 3,970,239. Salem is the capital of Oregon, with a total population of approximately 160,614 according to the estimates of July 2013. 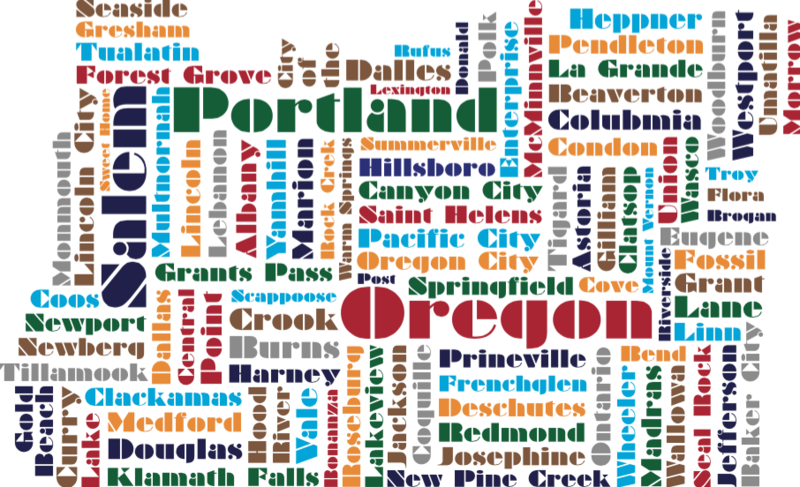 The biggest city in Oregon according to population is Portland, which has a population of approximately 609,456 according to the estimates of July 2013. Other major cities in Oregon include Eugene, Gresham and Hillsboro, which have the populations of 159,190, 109,397 and 97,368 respectively according to the estimated projections of July 2013. Salem has moderately warm temperature in summer with average high temperature of around 82°F (28°C) in August and moderately cool in winter with average low temperature of approximately 35°F (1.4°C) in February. Major industries in Oregon include timber, paper products, farming coal mining and computer-related equipment. Major exports from Oregon include processors and controllers, wheat, machines for manufacturing semiconductors and electronic integrated circuits. Whereas chief imports to Oregon include potassium chloride, photosensitive semiconductor devices and parts for machines involved in the manufacturing of semiconductor devices. Oregon is very famous when it comes to outdoor traveling and it contains more than two dozen scenic byways, which is more than any other state in the U.S. Among them, West Cascades Scenic Byway is a very beautiful highway which goes near the foothills of the Cascade Mountains between Portland and Eugene. East Steens Tour Route is also a remarkable route which passes near the deserts of Oregon, along with several hot springs and offers the views of Steens Mountain. Volcanic Legacy Scenic Byway is another gorgeous route which starts at Crater Lake National Park and terminates at Klamath Falls. I-5 is a major highway which starts in California, goes through Oregon and ends at Washington. Another primary highway in Oregon is I-84 which goes from Portland to Idaho. Oregon Route 35 and Historic Columbia River Highway are also two famous and notable highways in Oregon. In terms of fuel prices, Oregon is one of the more expensive states in the U.S. A gallon of regular gasoline in Oregon currently costs about $2.99 per gallon. So whether you are shipping a car to Oregon or from Oregon, Best Price Auto Shipping has you covered.